creative savv: Would you believe a cashmere sweater for 99 cents? Would you believe a cashmere sweater for 99 cents? I know. It sounds unbelievable. But believe it. 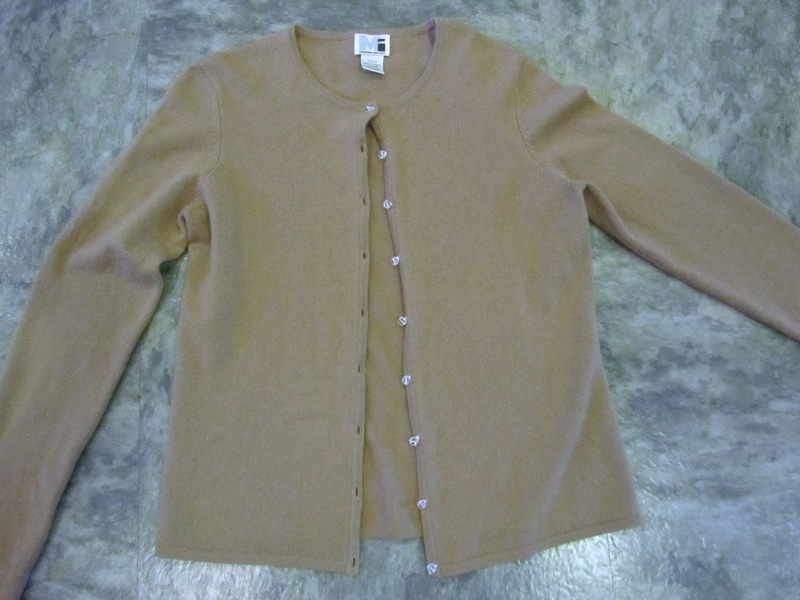 This cashmere sweater, for 99 cents at St. Vincent de Paul, a couple of Sundays ago. Every time my daughters and I go to SVdP, for their Sunday 99 cent clothing deal, I make a quick pass by the sweater section. I've been scouring the racks all summer, for a cashmere sweater or two. The only real drawback to cashmere is the cleaning. However, I was doing some reading, and apparently, dry cleaning is not the best way to clean cashmere sweaters. It's just the easiest. Very gentle hand-washing, in a basin of 85 degree F water, with a bit of baby shampoo, is what several experts recommend. Rinse in clean water, avoiding twisting of the sweater. Press the water out of the sweater (don't wring), and lay flat on a terry towel. Roll the sweater up in the towel, to press additional water out. Then, unroll, and lay the sweater flat, and pull into shape on a horizontal sweater drying rack. Allow to air dry. I've done this sort of thing with my cashmere sweaters before. I just didn't know it was the best way to clean cashmere. Who knew?! And now I can feel better about some of my cheapskate ways! Hoping you had a nice break with your daughters. We're starting to have cooler nights here in Michigan. The days are still nice and warm but it is getting dark quite early in the evening and the mornings stay dark as well. That is a nice sweater. I bought about 5 delicious sweaters at a garage sale about 3 years ago and I think one or two were cashmere. Sadly, my cat clawed into one of them and pulled a strand and left a hole. I couldn't fix it without leaving a pulled look so I pressed an applique over it. Lesson learned--don't pick up a cat wearing nice sweaters! Oh, what great finds at the garage sale, with those sweaters. What a shame about your kitty's claws, though. But I must commend you, you did a great job hiding the hole! It's cooler here at night, too. Better sleeping weather. I added my flannel flat sheet to the bed, for an extra top layer for the shoulder season. Wonderful find on that sweater, Lili. I have a grey cashmere sweater that same style that I found at the Goodwill Outlet store that cost me a dollar or less too. I also hand wash cashmere and it turns out just fine. Hooray for nice clothes at a great price! Is the Goodwill Outlet store different than regular Goodwill? Your sweater sounds lovely! Yes! Awesome clothing that doesn't compromise the retirement savings. Hi Lili, the GW Outlet sells clothing for $1.69/lb, and only 89¢/lb for a 25+ lb purchase. Out of curiosity, I just weighed that sweater and it is 7 oz, so it cost me about 75¢--Crazy low for a sweater I really enjoy wearing! We have several in the Portland area, and while it can take a lot of digging to find something great, it is kind of an adventure! Hope you had a wonderful break. Just finished dinner and Lunches for a few days. Hope you are getting some nicer weather. It was starting to fill like fall here but the projected high is 104. Cute sweater. I love SVDP they have the best prices. Oh my goodness! 104 is hot, hot, hot! SVdP has the best thrift store prices in my area. They spoil me, so that when I go into Value Village, I feel $6.99 is a complete ripoff for a sweater! Ha ha! I'm not sure I could shop full-price at the mall ever again! I'd have a heart attack at the register, I think. I've actually never had a cashmere sweater. Either didn't want to spend the money or extra time cleaning. However, I think at $.99, I could give it a try. It looks you got one that will go with most anything. Did you daughters find anything interesting during that trip? I should post photos of some of the other clothing we've bought this summer for 99 cents. One daughter chose this really beautiful white cotton dress, again for 99 cents. She looks lovely in it. the other daughter wanted a short-sleeved tee shirt, which she found, a cute one. And I bought a casual top for fall for myself. I always find something there, for cheaper than dirt. How is the moving process going? When do you close? I can only imagine how much work is entailed. I wish you the best of luck and grace with this move. We closed a little over a week ago. Making good progress, but still lots to do. When I get a chance, I'll post an update. Thanks for asking. The days sure went by fast....hope you had a wonderful time with your daughters, and did lots of fun, memorable things. Recently I've been buying Kmart additional 30-40% off clearance clothing for our grandchildren, and getting almost 100% back. Since the points must be spent within 14 days, today we stopped by a Kmart store that is closing in three months and stocked on some liquidation sale 30% off already clearance folding chairs and other good finds. I love it when I can buy clearance on both the front and back ends of a points rebate deal. That is a nice classic sweater, in cashmere too. What a find!! Quality like that should last for years, and save in that way too. Sounds like wonderful deals at Kmart! And what a great use of the points and clearance, clothing for your grandchildren. Thanks! I'm glad to be back, too! I know! I just love SVdP's 99 cents Sundays.